We wear our shoes each and every day, and yet we often neglect to care for them sufficiently. Although we rejoice in having healthy feet, we usually take foot health for granted; many of us subject our feet to unhealthy conditions on a daily basis. Most people are born with healthy feet. However, the seeds of foot conditions are often sown during childhood, leading to complications later in life. Since parents choose shoes for their children, and since children's feet are still protected by cushions of fat, children often end up wearing shoes that are actually too tight or too wide. Orthopaedic shoes and medical insoles can help treat foot conditions once they arise. Adults often opt for cheap, ill-fitting shoes made of synthetic materials that do not let feet breathe. This results in problems such as calluses and sweaty feet. Since these kinds of shoes create a warm, moist environment, they can also lead to the development of athlete's foot and toenail fungus. All of that being said, it is easy to maintain healthy feet in the long term. 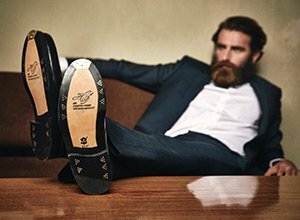 In addition to wearing quality-men's shoes that are Goodyear-welted and made of leather, you should follow a few simple rules. Make sure to wash and thoroughly dry your feet on a daily basis. Pay particular attention to the spots between the toes, since these can easily become breeding grounds for a fungal infection. Also make sure to regularly apply lotion to your feet. This protects the skin from drying out and becoming brittle. Take care to keep your toenails short, and regularly, carefully remove calluses on the soles of your feet with a pumice stone. You should never cut calluses off, since this could lead to an infection. Finally, try to walk around barefoot when you are at home. This is the best way to relax tired feet and keep them in good shape. Just like feet, shoes should be treated to regular care. Shoe leather, after all, is processed animal skin— proper care keeps it nourished and preserves shoe durability and appearance. 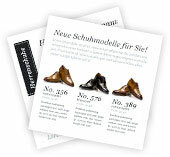 You should also seriously consider purchasing classicmen's footwear fashion for a timeless, stylish look. Shoemakers producing classic shoes work in keeping with a long tradition—in terms of their construction, production method, and manufacture , classic shoes have hardly changed since the 19th century, as a look at shoe history confirms. When you have healthy feet and perfectly fitting shoes, you do not need insoles. Should the need arise, though, insoles can help restore your feet to a healthy state. Sweaty feet are preventable. They usually result from improper, synthetic footwear, and can quickly lead to athlete's foot. Wearing Goodyear-welted shoes helps prevent sweaty feet. Calluses protect subcutaneous layers of skin. They form when skin is put under strain, and normally disappear on their own. When they persist, the underlying cause needs to be investigated. It lurks everywhere people go barefoot: athlete's foot is an unsightly condition that requires immediate treatment. It is highly contagious, and secondary complications are likely. Usually a secondary complication of athlete's foot, toenail fungus makes nails brittle and unsightly. While time-consuming to treat, it is very easy to prevent. If you suffer from a foot condition, orthopaedic inserts and shoes can provide treatment. Nowadays, orthopaedic shoes are far more stylish than their predecessors.